Today over 1 million students are expected to go back to school in the UAE, after the long summer break. But, the new academic year can cause stress for children, parents and teachers –as a return to school can be extremely hectic for all. From daunting first days to getting back into a routine and experiencing the back to school blues, both parents and children are faced with many challenges at the beginning of the school year. After the summer holidays, parents will understand the stress of buying new school supplies, trying to get kids to sleep at a reasonable time and making sure uniforms are ready for the morning. Mums and dads also have the pressure of ensuring that their child is mentally prepared for the new term or their first day at school, as parents are challenged with their child’s anxieties and consequently their own. From making friends to starting a new school and being separated from their families for the first time, school can be overwhelming for children, and parents have to be prepared for the challenges ahead. 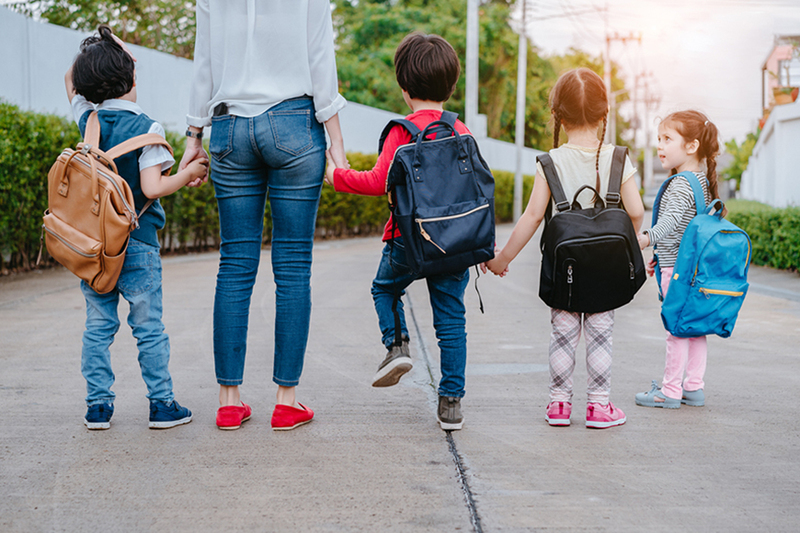 Whether it’s a daily debrief over dinner, making a special packed lunch or getting organised with uniforms and school schedules, there are lots of little things parents can do to make the return to school in Dubai and the UAE easier. This is the first step to getting organised for the new school year ahead. Try to use a notice board or large calendar that the whole family can see and make use of. Use this space to write down all the important dates and memos you to need to know. Whether it’s an after school activity, a permission slip or a school trip, mark everything on the school calendar –to help get organised and never forget a P.E kit! P.S. Don’t over-schedule the kids, and tire both them and yourself out too much, make sure there’s blank spaces on the calendar for them to be bored and have a break! Don’t let them sign up to every activity they can! Despite the back to school worries, try to still mark the occasion and create a family tradition with a photograph to capture the milestone moment. It might be that you want to do a before and after of your child immaculately dressed on their first day compared to their last day of term! Or you want to record the day with personalised craft and chalk boards, with special messages and the important date. You’ll love to look back on these in years to come. If your child is particularly anxious about their first day back, send them to school with a couple of treats to make them feel better and put a smile on their face. From cutting their sandwiches into a funny shape, to packing their favourite sweets and including a handwritten note –these little touches will help to reassure your child and help them through the day. There’s nothing worse than rushing in the morning to dress, feed and prepare the kids for school, you don’t want to be ironing uniforms last-minute and frantically try to find the other school shoe. Where possible try to prep uniforms for the week ahead on a Saturday night, create hanger labels for each day and always lay out clothes the night before. Try to have spares of everything and keep on top of the growing laundry pile, get into a routine and schedule uniform prep to suit your routine. The first week back at school is tiring for everyone and getting back into routines can be particularly difficult, but getting a good night’s sleep is key for going back to school. Students who don’t get enough sleep are lethargic and struggle to remain focused; from nursey school to high school sleep is important. The quicker you get your kids back into a routine, the better. So remain stern and stick to the bedtime rules you enforce. Set a school night bedtime, remove tablets and screens at least an hour before bed and ensure kids have a wind down time with baths, stories and chats over warm dreams. For the little ones it can be hard to say goodbye in the morning –drop-offs are difficult for everyone! But if your child does get upset, do not linger, reassure them that you’ll pick them up later and leave. It sounds brutal, but five minutes later they’ll be happily in the classroom with their friends. Prolonged goodbyes only make the situation worse and can leads to parents getting upset as well, which in turn make the child more distressed. If your child suffers from separation anxiety, you have to be strong and stern, whilst still comforting your child with the reassurance that you’ll be back later. It sounds obvious, but whether your child has had the best or worst day, make sure to discuss it with them after school. Whether it’s in the car or whilst eating dinner, make sure to check how your child is at school, particularly during their first week back. Ask what did they learn that day? Or was the teacher nice? Talking through their experiences regularly will help to keep an honest dialogue with them and put your parent worries at ease. If they have had a difficult day you can share your own tough experiences, give them advice and the love and support they need to go into the next day. It can be difficult to get your child to concentrate at home, especially when they first return to school and they’re still in summer mode. So dedicate an area to homework in your home and stock it up with school supplies and glittering gadgets, so kids don’t need to be distracted by breaks to find a pencil. This is another step to getting organised and getting into a good school routine. If you’re anxious parent, you can create an anxious learner. Try not to put the pressure on yourself or your children, we all make mistakes and it can take time to get things right. It’s important to have a break from parenting worries, so once the kids are in bed and everything is prepped for the next day, take some down-time for yourself. Make sure you have a couple of hours where you’re not thinking of play dates, homework and P.E kits. It’s important to remember yourself; you’re more than just a parent! Don’t forget to enjoy your children growing up and making milestones, whether it’s a 10/10 on a spelling test or their first school play, make the most of the little moments and be sure to capture them. Put (questionable) artwork on the fridge, make scrapbooks and still spend quality family time together when you can. Make sure you’re making memories and making the most of living in one of the most diverse cities in the world!